We decided to go for a bit of a drive yesterday and what a better place than Port Douglas on a Sunday, when the markets are on? So we left Cairns early and hungry, with no breakfast whatsoever. But we knew that a delicious meal was waiting for us at one of the cafés in Port Douglas, that we have made into a bit of our routine when we go up there. 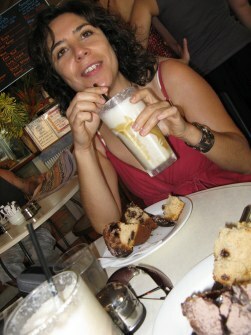 We always order their muffins, they are absolutely delicious. It seems we didn’t manage to keep Java Blue a secret, yesterday the place was absolutely packed with tourists, all of them after the same delicacies we were too. However, we managed to find a little table inside and were very happy indeed. Then it was time to stroll around the markets. We’re looking for presents to take home when we go to Spain for Christmas, but we didn’t want to take the typical boomerang, basically because we have already done so and unfortunately we can’t keep on buying the same presents all the time. So this time we’re looking for something more elaborate, and it’s not easy. I think we have found what we wanted, but I’m afraid I won’t be let the secret out, just in case my family happens to read this post and finds out before we get there. We’ll tell you when it’s all over, see what you think. The markets are a fantastic place to spend a couple of hours on a Sunday morning. Lots of different stalls, from fruit selling to second hand items, bric a brac, souvenirs, clothes and accessories, furniture, art, etc. 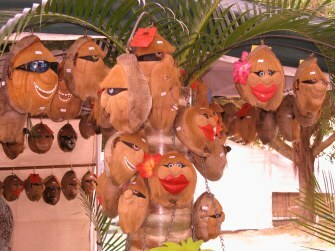 But my favourite stall is the one which sells the coconut faces. They are superb, so funny and tropical and different from your “Made in…” souvenir. I’m tempted to buy a couple, one to give away and another one to keep myself and have a laugh every time I look at it. Have a look at the pic below, don’t you think they are funny faces? 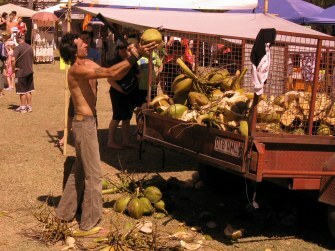 Steve was completely fascinated by the guy peeling and cutting coconuts. Although it’s not very clear in the photo above, he was using one of those knives that pirates used to use and was absolutely amazing handling it. If it was me cutting those coconuts, I would be in hospital right now. Where we live there are lots of coconut trees everywhere and when the season comes, you can see all the coconuts lying on the floor. I love coconuts so one day I decided to take one home with me, cut it open and eat it. Well, easier said than done. I tried cutting the coconut with every tool and instrument I found in our house. I ended ut with a hammer hammering the coconut as hard as I could but the freaky little thing resisted and I ended up giving up and thowing the coconut away. From then on, I buy all coconuts from the guys who know how to do it. Easy!!! The sugar cane guy was also an interesting sight. 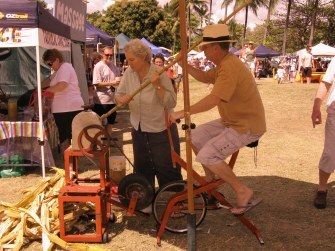 He has modified his bycicle in such a way that he can squeeze the juice out of the sugar cane by peddling. I guess the peddling starts some sort of machinery than then squeezes the canes. He’s more than willing to let you try, of course he would be in such a hot day as yesterday. I must say we were slightly careless and now we’re suffering from a bit of sunburnt. What would my mother in law thinks, as Steve always tells me. But one of the funniest sights of the markets yesterday was the one just above. I guess this guy hadn’t been such a great father (for those of you who didn’t know, yesterday it was Father’s Day in Australia) and his kids had taken revenge on him by giving him “a massage” as a present. When he got off the bed he had red marks all over him but a big smile on his face, so I reckon it wasn’t as bad as it looked. 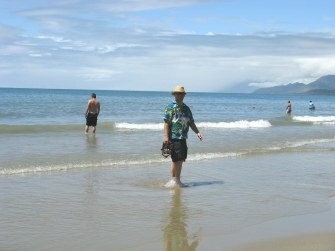 And after we had stopped at every single stall at the markets, we went for a walk on Four Mile Beach, the prime beach of Port Douglas. It doesn’t take much imagination to find out why this beach has been given such a name: it’s four miles long and fabulous. By Australian standards, at least in the Far North, the beach was crowded, with more than 30 people playing, laughing and having a swim. Even the lifegards were enjoying the day out, playing cricket, very different from the tv shows about the lifegards in places such as Bondi Beach, where they don’t get a minute rest saving lifes. The water was really inviting, very clear and refreshing but since Steve wasn’t wearing his swimmers, I didn’t want to go for a swim on my own. Nobody to duck under the water, you see? This entry was posted on Monday, September 8th, 2008 at 2:11 pm	and is filed under At home in Cairns. You can follow any responses to this entry through the RSS 2.0 feed. You can leave a response, or trackback from your own site.